Thank you all so much for joining us on this amazing, crazy, inspiring, exhausting, gigantic, phenomenal, and life-changing whirlwind tour around the world. Over the past ten and a half weeks, we had the opportunity to visit over three continents, over 13 countries, and over 18 cities. We ate Peking Duck in Beijing, drank Crémant in Strasbourg, hiked through woods in Mount Vernon, performed on a cruise ship in South Korea, ate Durian in Singapore, showered in Sulfuric water in Iceland, went pubbing in Dublin, shopped 'till we dropped in Hong Kong, bathed in Onsens in Japan, and scoured the globe, seeing, eating, doing, and learning more than we could have possibly hoped. It is such a supreme privilege to be able to have had an opportunity like this one, and it could not have been possible without the help and love and hard work from our our phenomenal hosts and guides all around the world and, of course, our family and friends. The memories that we made these past two months will not only annoy friends and satisfy family members for months to come but will also be an unforgettable set of experiences that we will always have to look back on. The end of a tour is always a cacophony of emotion, having spent so long with so many amazing people - family, really - and it is not easy to have to say goodbye. But in addition, the end of tour also marks the end of the journey in the Dins and at Harvard for our graduating seniors, and we will miss them so dearly. Returning to family and to friends, I personally struggle with the question: "How was tour?" After all, how can you put into words all of the things that you did, all of the emotion that you felt, the highs and the lows, all of the people that you met and conversations that you had, all of the shared experience you had with people that you care about - experiences that only you and eleven others will ever have? It is a really beautiful thing, when you think about it, and I know that these past two months will always be one of the most amazing experiences that I will ever have - that we will ever have. So, again, a thank you. To the people who made this possible, and who continue to make this possible for years and years and for Dins to come. To the hosts with whom we shared complex and fascinating conversations and who opened their homes and families to us. To the audience members who fill the seats and make tour possible, whose enthusiasm allows us to keep performing even when life gets in the way. To the family members and friends who stay up really late to talk to us across the world, who send their care and support unconditionally. We appreciate it so much. And we cannot wait to see you in two years. All together again! The Dins reached the final tour stop after 10 weeks of travel and were reunited with yours truly, #247. The rest of the Dins had a tough flight from Sydney with a layover in San Francisco before arriving to SeaTac airport at around noon on August 6th, while I arrived from New York’s JFK airport a few hours before. I made sure to be waiting outside their exit gate before they walked off the plane, so I could see the look of excitement on their faces, as we all got together for the first time in months. One by one, I hugged every single Din. As we waited for our backlogged luggage, I heard about the groups travels all over the world, from their adventures in Strasbourg to the typhoons in Japan. Slowly but surely, I felt myself be immersed in the experience through their storytelling. It felt like I had been with them the whole summer! Gathered in Volunteer Park for the first set of Toasts. After leaving the airport, we went our separate ways to recharge after a day of travel. Brian and I were paired up in a comfy house in the Queen Anne neighborhood, north of the city. He, Michael, and I quickly dropped off our belongings and explored the city a bit, taking in the beautiful sights. I can honestly say Seattle is one of the most beautiful cities I have ever seen. It is large without being daunting, easily navigable, and the surrounding bodies of water give it a very relaxed feel. In addition to all that, it also has so many cool spots to eat and relax. Later that first day, Michael, Brian, and I got a taste of the local seafood scene before meeting up with Eli, Austin, and Andrew. We walked around downtown, visited the original Starbucks store, and relaxed by the water. The next day, we all got up early and met at Volunteer Park to do Toasts. For those who don’t know, toasts are when each member of the group and their achievements are highlighted by every other member of the group. It was so nice to hear everyone say such nice things about each other, things that were so personal and thoughtful. We didn’t get anywhere near finishing that morning, because of many uber eats runs and plenty of breaks, though. That night, I performed at my first gig in about three months. Safe to say I was pretty nervous, but being on stage with everyone made it a whole lot easier. We got through our performance at the church, and the crowd really enjoyed it. A photo of the (underwhelming) Space Needle in Seattle. The next day we again met early to do toasts, but this time in a park near the Space Needle (surprisingly underwhelming by the way). It was bittersweet, however, because as we got to older Dins, it was less likely they would come back, and for some it wasn’t possible at all. After that we regrouped and started our journey to Mount Vernon, with Michael’s family graciously driving us up to their home. They cooked us a delicious dinner and we managed to ~almost~ finish toasts in a nice little campsite off in the woods near Michael’s house. Then, we got ready for our last performance together in the historic Lincoln Theatre. The theater gave off a very vintage vibe, and the dressing room we were given reminded me of ones I had seen some of my musical idols prepping in. We messed around before and after soundcheck, but when the time to perform came we were all dialed in. We did a two part set with an intermission, and when we got off stage it was evident we had all exhausted ourselves, but it was more than worth it. Plenty of people came and congratulated us, and we spent an hour or more meeting the locals. After the gig, Ethan stood up and gave a little speech about how everyone had missed me on tour and how he had a present to represent their travels that he wanted to give me. It was a great gift, and we all had a good laugh after! A final photo with all of the Dins in Mount Vernon. Upon getting back to town we found a little park by the UW campus and finished toasts. It finally being the end of tour, we stood in this park sang our family song "My Lord What a Morning". It was a beautiful way to bring things to a close. One by one, we went our separate ways to our homestays, each of us clutching little souvenirs of our time together. Some of us made plans to meet up over the next few days, while others had to leave early for flights, but wherever we went after, we still carried the memories of a job well done and a summer we’ll never forget. A photo of the Sydney Skyline! G’day mate, and greetings from down unda! Welcome to Sydney, Australia: home of the iconic Sydney Harbour Bridge, the Opera House, many marsupials, and of course, Nemo’s temporary residence during his dry-land-days. While we weren’t able to track down P. Sherman, 42 Wallaby Way, Sydney, the Dins did have a lot of fun in this wonderful seaside city. We kicked off our stay with a performance at St. Paul’s College of Sydney University, which happens to be Australia’s oldest university college. This ended up being a performance during a welcome dinner for the spring semester (southern hemisphere = flipped seasons!) and new residents of the college. After the performance, some of the Dins split off to explore various parts of Sydney’s night life. Eli and I journeyed out to some of the historic bars and pubs, such as the Hero of Waterloo pub, the oldest pub in Sydney, and others went to get late night bubble tea—continuing a tradition of attempting to have bubble tea at every stop on tour! A photo of the iconic Sydney Opera House. As we approach the end of tour, the conversations and memories made tend to be equally poignant and reflective, looking back at all that we have done and all we have seen. Sydney is a beautiful place for such experiences. It really is a very relaxing city. It also happens to be the first place where everyone has spoken English since being in London in early June...albeit with a distinct accent! 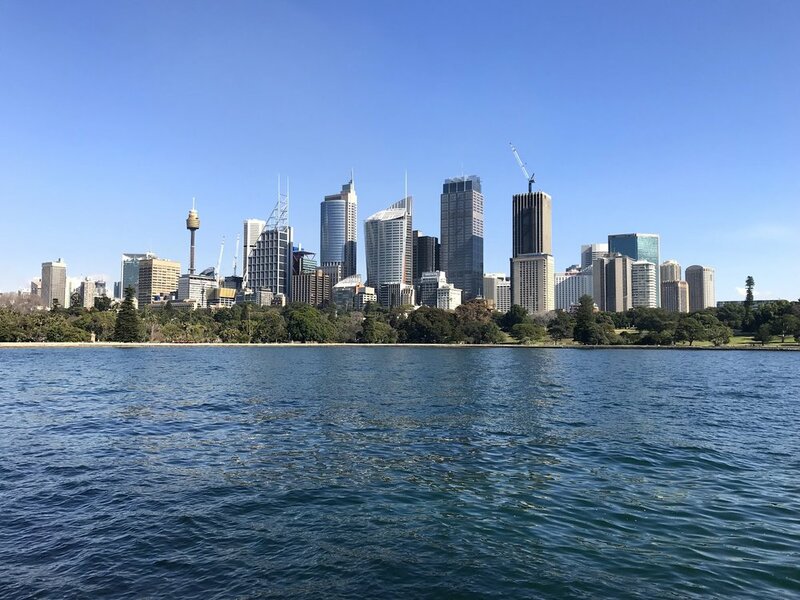 The following day was spent traveling around the city, exploring parks, walking along the harbor and doing the things recommended by “true Sydney-siders,” the proud residents who have always called Sydney home. 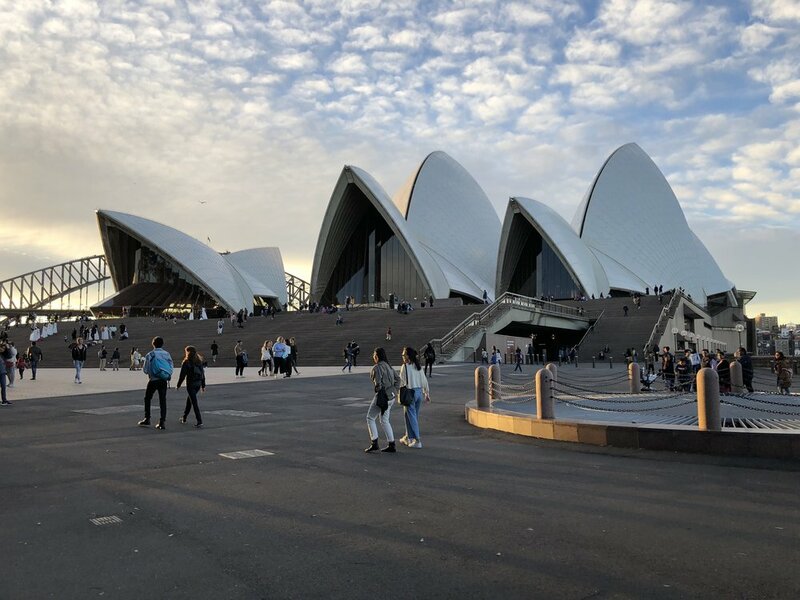 Some went to the Taronga Zoo to see koalas, Tasmanian devils, and wombats, while Sam, Sang-o, Eli and I went to catch a matinée at the Sydney Opera House called The Long Forgotten Dream. The show engaged not only with the intersection between traditional indigenous aboriginal culture and fast-paced western culture but also specifically learning how to participate in the globalized world, while still remaining tuned in and reverent to ancestry. Jubilant Dins boating on the Sydney Harbor! That night, we held our final international performance of our 2018 World Tour at the Royal Sydney Yacht Squadron. The performance was one to remember, with a wonderful setting, excellent lamb cutlets from New Zealand, delightful conversation, and an impromptu performance from one of the guests who played the spoons! Absolutely wild, right? And both Dins and audience enjoyed the evening immensely. Enjoying the uncluttered vibe of Sydney, I joined Dins and went stargazing, since for the first time in months, we found ourselves in a place with such low light pollution that we could see every star in the sky. Casually backflipping into the ocean during Winter. Our final day in Sydney was a particularly fun one, as one of the hosts graciously offered to take the Dins boating in Sydney Harbour. So, the day passed by with kind company and a series of shenanigans, like doing flips off of the front of the boat into the harbour with the Sydney Opera house as a backdrop. Truly a landmark way to begin bringing the final international stop to a close. At night, we celebrated with our hosts, at a wonderful potluck (with a spread unlike anything I have ever witnessed), singing a few final songs and drinking local Shiraz. We all agree that Sydney was one of the most remarkable moments on tour, and while we are excited to head home to the United States, the end of this phenomenal tour stop is bittersweet. After Singapore, the Dins headed to Seoul, South Korea! For several of the Dins, including Andrew, Peter, and me, this meant a brief but amazing few days to visit family. Landing in Incheon Airport late at night, we were warmly greeted by relatives, including some of my family and grandparents, and then were promptly bussed into the city proper where we checked into a traditional Korean house, called a hanok. A con-din-gent visiting the National Palace! The next morning was a lazy one, as many of the Dins attempted to recover from a tiring flight and an intense week in Singapore. In the afternoon, a contingent broke off to explore Korean history by visiting Gyeongbokgung National Palace right next door and sampling the local bibimbap, a rice dished mixed with assorted vegetables, beef, and red pepper paste! I *ahem* knowing Seoul like the back of my hand - just kidding -, decided to split off and meet a few of my college friends across the Han River at the bustling Gangnam Station, where I indulged myself with traditional spicy rice cakes and the popular shaved ice dessert bingsu for a glorious few hours. A photo of a traditional bowl of Bibimbap. The Dins all sharing a wonderful meal together. Later that night, the Dins headed to the Han River where we had secured an exclusive concert venue at the Cruise 378. In an intimate restaurant setting, the Dins regaled an audience of family and friends with a night of jazz and comedy to remember. After weeks of performing for mostly strangers, it was a truly special opportunity to sing for loved ones and give them an up-close look at my college experience. The following day, the Dins visited Peter’s high school alma mater in Yongin, a nearby city, for yet another special performance reminiscent of our time in Wohlen, Switzerland! After our "Up Close and Personal", we had the chance to exchange stories with the students about their Korean high school education and our American college experience. As always, it was incredibly uplifting to watch the students warm up to us as we entertained them with comical anecdotes from our time at Harvard. That night, we were treated to a wonderful dinner by Andrew's parents, eating everything from bibimbap to kimchi and Heugimja-juk, a black sesame soup, It was great getting to share some of the food I grew up with with all of the Dins. Though only in Seoul for two full days (plus extra hours in the airport! ), we really had an amazing time, dotted with family members treating us to dinners and wonderful performances. I couldn't think of a better way to wrap up our time in Asia! Now, off to Sydney! There are many fantastic stops that we’ve been to this tour, but our latest one, Singapore, has been especially meaningful. During our week in the island city-state, there were many fun performances to enjoy, beautiful sights to take in, and daring foods to try; however, what really made Singapore important to us was our opportunity to spend time at the Pathlight School. The Pathlight School is a large and successful school for students with autism, which we are connected to by Ng Sock Kian, the mother of a Din alum. The school was also co-founded by a friend of Sock Kian’s, Denise Phua, who is now the mayor of central Singapore. Mayor Phua also works with the Dins, organizing where we perform whenever we visit Singapore on tour. As a result, our time in Singapore is centered around our work with the Pathlight School and A Very Special Walk, a fundraiser for the Autism Resource Center of Singapore. A photo of the Dins and the students at the Pathlight School. We spent several afternoons at the Pathlight School, both performing for the students and rehearsing with several student choirs who would sing with us at A Very Special Walk. The rehearsal with the students was incredible; we sang fun songs and worked with one another to learn choreography. It was a special moment for me, because I have relatives and friends with autism, so I took the time to reflect. The Dins were invited into a marvelous school of 1300 autistic students, and we were honored enough to sing and have fun with them, to see each student showcases their abilities, and to witness the goodness and love the teachers had for these students. It was truly a blessing. A photo with Mayor Denise Phua, after a performance at the Raffles School. The Super Trees and the famed Marina Bay Sands Hotel. Outside of performing, we also had outstanding experiences exploring. On our second night, we all set out to attend Singapore’s light shows. A handful of us went to the light show on the harbor, which involved intricate designs of color reflected off sprayed mist on the shore. Most of us, on the other hand, went to the Super Trees light show. These massive, artificial trees were lined with patterns of lights that glowed a variety of colors during a suite of famous opera songs. Many of the Dins who attended this, including me, thought that this was one of the most memorable experiences of Tour. The finale of the show was Luciano Pavarotti’s renowned rendition of Nessun Dorma, paired with a brilliant flood of sapphire, vermilion, and every other color you can think of. The only word to describe it was magical. Other experiences that Dins embarked on in Singapore were slightly less fruitful. A group of adventurous Dins decided to try Durian, a thorny Southeast Asian fruit considered to be a delicacy in Singapore. Of course, this would not have been an adventure unless there was risk involved: the durian, once opened, smells to most like a mix of sewage, rotten onions, and trash. Durian is banned from Singaporean public transportation and even some hotels because its horrific odor lingers for days. On top of that, many claim the taste matches the smell, while others argue that it is quite delicious. Sam, Ethan, and several others mustered the courage to eat it—and boy, did they hate it. The only one to walk away not insisting on his hatred for the fruit was Sam, who essentially described it as “not bad, but certainly not good.” Anyway, it made for a good story! A photo after A Very Special Walk! Our final full day in Singapore was action-packed, starting in the early morning with A Very Special Walk. It was truly special to be a part of such a large event that raised money for adults with autism, which is an often forgotten group of society. The sun was strong, and it was the hottest environment I had performed in for all of Tour so far. Nonetheless, we had a terrific time, and the event raised over $750,000 USD—a huge success! Later that day, we performed one last time and capped off our final night with a trip up to the top of the Marina Bay Sands. The Marina Bay Sands is a colossal 5-star hotel which looks like a surfboard on three stilts; it is incredibly iconic in Singapore. With most of us donning our suits from Pinky Tailor in Bangkok, we ascended to the top of the landmark in style and soaked in the wonderful view. An extraordinary final day for an extraordinary stop! I will cherish the memories made in Singapore for years to come. Some of the Dins christening their brand-new Pinkys Suits on the top of the Marina Bay Sands Hotel! Bangkok was phenomenal. I’ll start there. The Dins arrived at night on Wednesday the 18th, and we headed straight to our hotel, the Sukosol, a gorgeous hotel a few miles outside the city center. We were all pretty tired after a long day of travel, so after getting some nourishment at a nearby 7/11, we all conked out. The next morning, groups of Dins met up to go and explore Bangkok. Thursday was a completely free day for us, and we all wanted to get an early start on taking the town. 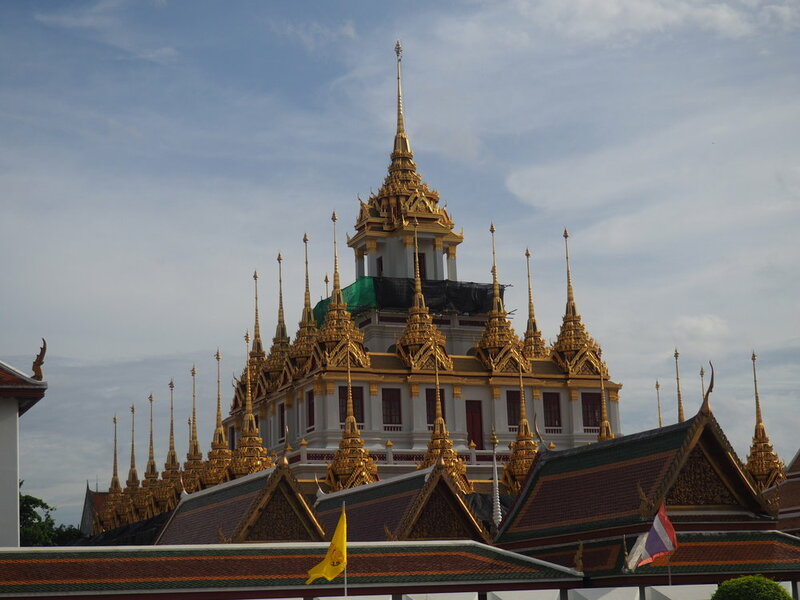 I, along with Kevin, Ethan, and Sam, hopped in a cab to head to the Thai Royal Palace. The four of us walked around the palace grounds and took some photos, taking in the architecture, a style vastly different than what we had seen so far on tour. Reds, greens, yellows, and gold abounded, with flame-like designs and a lot of pointy adornments called Stupas. A casual photo of the Reclining Buddha at Wat Phra. 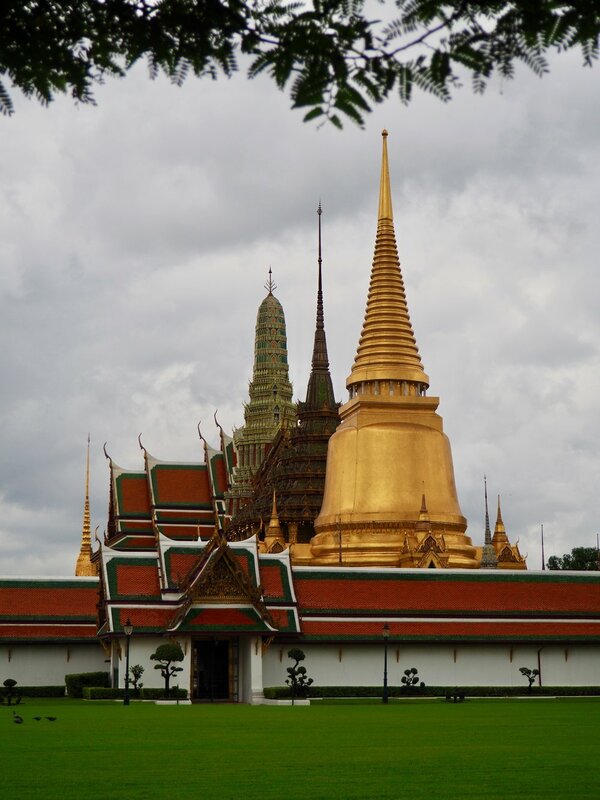 We, then, headed toward Wat Phra– wat being the Thai word for temple – the home of the famous Reclining Buddha. 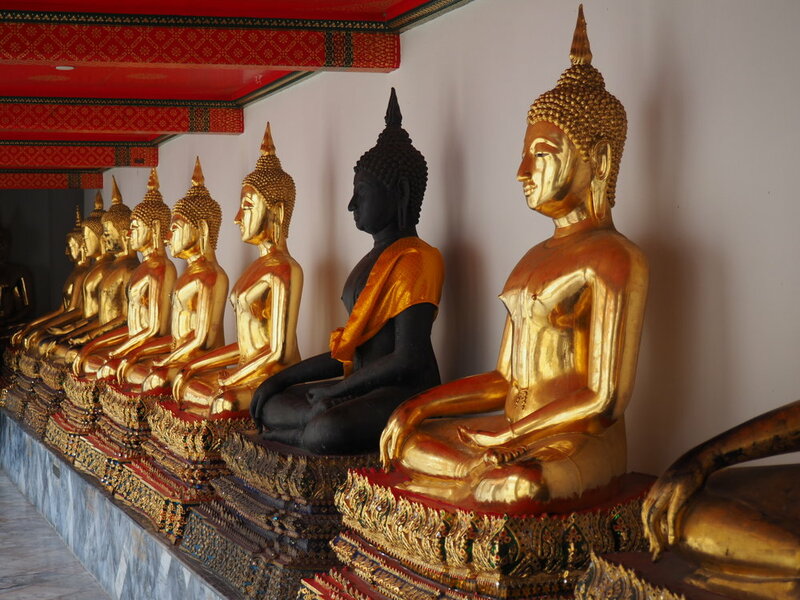 The Buddha lived up to the hype – or lived down to it? It was massive, and words don’t do its size justice. 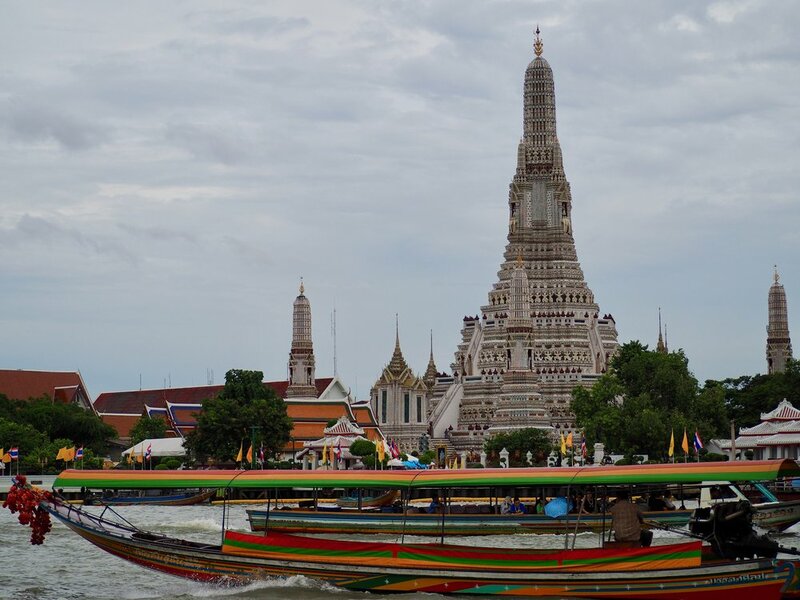 After Wat Phra, I split off from the group in order to explore the city with a bit more speed. In the next four hours, I managed to walk across the whole city, take a three Bhat ferry across the river, see an additional four Wat and a Dragon shrine, partake of some on-point street food, have a conversation about Thai politics with a Thai political science professor, and eat the most phenomenal vegetarian Pad Thai I have ever had (a large plate + large glass bottle of water was 100 Bhat = $3 USD)! It was great to have a bit of personal time to explore, and it was one of the best and most tiring days of tour for me! That night, the Dins all met up to head to Pinky Tailor, a long-standing tradition for the Dins. Pinkys is a tailor shop the Dins visit every tour to buy cheap but wonderfully-made custom suits. Picking out fabrics from the copious selection and getting measured for hours is a bonding experience like none other, and we were all so thrilled to be getting some dapper looking formal wear. Wait 'till Singapore to see photos! After that, all of the Dins rushed on over to a nearby movie theater to catch a screening of The Incredibles 2. We laughed and we [read: I] cried, and we all left the theater, mouths agape because it was so spectacular. The next day, we had an early wake up – and we walked down the street from the Sukosol, to perform at a local school. We had such a fun time at the performance, and the audience seemed to love it! We were each presented with a really nice boutonniere, which we wore during the performance. After, a few of us took advantage of our short break to hit up the pool and the gym (probably working out for the first time in over a month!). That night, we had two back-to-back performances at the Sukosol, the first for a group of ambassadors and diplomats and the second for an intimate crowd of hotel guests. The Dins along with our wonderful hosts and guides after our performances at the Sukosol Hotel. A photo of Sang-o at the Siam Hotel, before our final performance in Thailand. 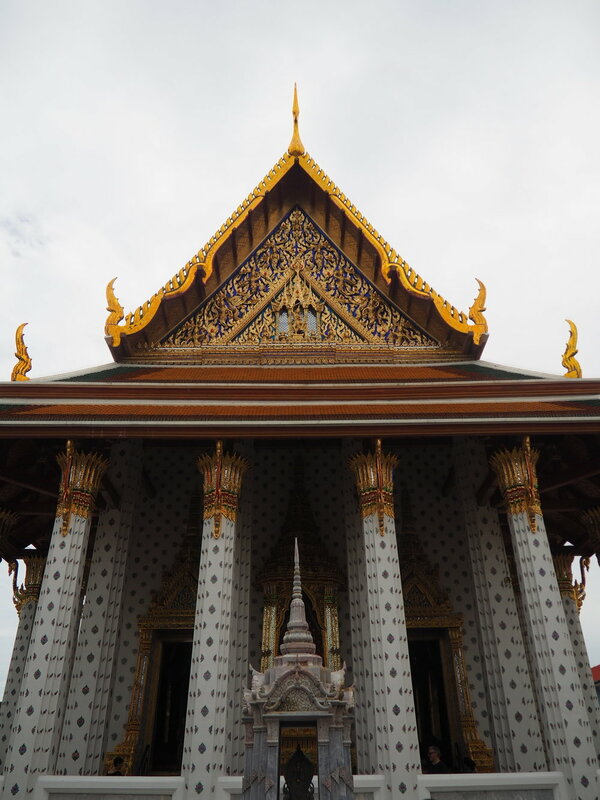 The next day, Kevin, Sang-o, Michael, Austin, and I went out to the Chatuchak Market for some shopping – and we were not disappointed. There were knock-offs and unique clothing pieces and lots of food. I could have spent so much more time there than I did – but I, at least, got a few cool items. Ending our time in Thailand, that night we headed over to the Siam Hotel, one of the Sukosol’s sister hotels, and we performed a really snappy set in a really cool space. Nylon Thailand, a fashion magazine, also stopped in to take photos and to write a little bit about us! 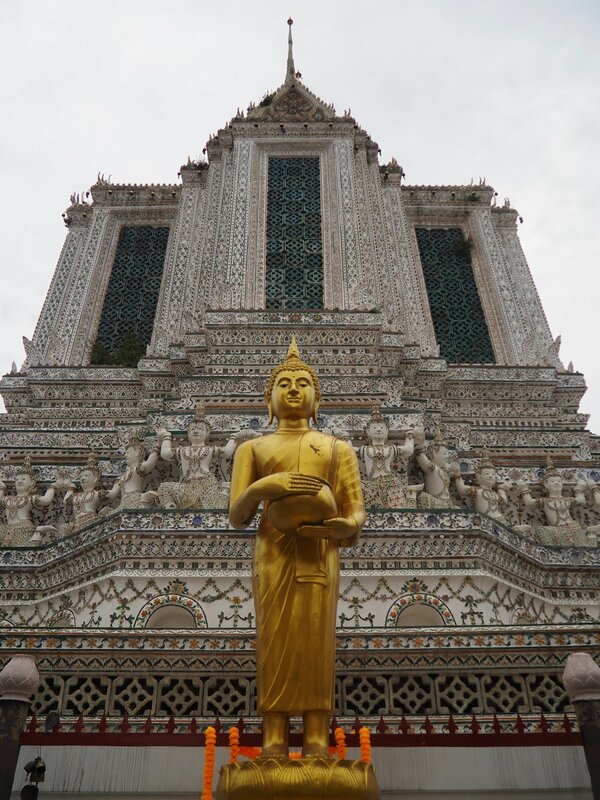 All in all, Thailand was one of my favorite stops of tour. The culture and the food and the architecture (and the people!) that we experienced were all so amazing and so unique, and I know that I will jump at the next chance I have to go back and explore more! Hey everyone—Andrew here. In all honesty, I flew into Hong Kong from Beijing with low expectations, as influenced by my mother, who said that she didn’t like Hong Kong very much. I was six the first time I visited Hong Kong with my parents, so I remember very little, with my highlight being the Ferris wheel at Ocean Park. Hong Kong, in the simplest of descriptions, was amazing. A giant, kaleidoscopic, cosmopolitan metropolis that exhibited herds of people walking from one crosswalk to the next, Hong Kong in the summertime was an exotic New York, with a key difference in the air. The monsoon humidity lingered with wafts of Cantonese cuisine and suspended automobile exhaust, all contributing to a peculiar but welcoming atmosphere. I felt strangely at home and at ease in Hong Kong. Staying at the Mini Hotel in Causeway Bay was a refreshing change to the Din dynamic, as we all resided in single rooms without any disturbance. I certainly had a pleasant time having alone-time, treating myself well with Asian face masks and Netflix. In comparison to that in Shanghai and Beijing, the Dins had far more free time in Hong Kong, allowing everyone to recharge and rest. On Saturday, July 14th, the Dins performed at the IFC Mall and the Mini Hotel near Ocean Park. I’d never experienced mall culture as strong as the one in Hong Kong, as huge malls were scattered throughout Causeway Bay all the way to Central. The performance at the IFC Mall was my first performance in a mall, and it was interesting to see people move in and out of the audience as we sang our songs. Afterward, we headed over to our next concert, and I was excited to visit Ocean Park after singing at the Mini Hotel. Alas, the monsoon got the best of me, and I figured that I’d ruin my childhood experience of going to Ocean Park if I were to go again in the pouring rain. On the flip side, however, we socialized with a couple of young audience members after finishing our concert at the hotel and agreed to go to Lan Kwai Fong, a nightclub, later that evening. Dins with new friends after performing at the Mini Hotel Ocean Park. From personal experience, Hong Kong nightlife could be reduced down to shouting, getting lost, and finding friends who also were lost. I constantly lost track of where I was, and the Dins in general lost each other. One of the friends we met at the Mini Hotel brought her mother along, and let’s just say that the mother got a bit…carried away. Because we never got her name, the Dins like to call her “Party Mom.” I think it’s a cute nickname. The next day, we performed a concert at The Charioteer’s Club, where we again met Wayne Fu, a former Din, after seeing him for the first time in Beijing. It was a small concert for family and friends. Afterward, the Dins were treated to a beautiful and plentiful dinner just downstairs, where we met the classic lazy Susan for the umpteenth time. Some really cute Dim Sum. On Monday, July 16th, the Dins performed at the Queen’s Garden apartment complex, as well as the Dragon Centre mall in Kowloon. We received very nice and sturdy umbrellas for free after the first concert, which would have been quite useful the day before when the Dins, being economical and all, decided to venture to the Charioteer Club by foot, fighting the pouring, violent summer rain. Oh well, our tails needed some cleaning anyway. That evening, the Dins decided to check out the area, heading to the Temple Street Night Market. Never have I seen more variations of a Louis Vuitton wallet than there. On Tuesday, the Dins performed the final gig in Hong Kong at the Mini Hotel in Stanley. All I remember was the scorching heat and my sweaty, drenched back. Whether it be sweat or rain, I eventually understood that wetness was an integral part to any Dins performance in Asia. One reason I fell in love with Hong Kong was its resemblance to New York. The city never slept, and people of all different backgrounds and interests filled the malls, food courts, sidewalks, and subway trains. For me, it contained the perfect mixture of new world exoticism and old world familiarity, and I cannot wait to go back to Hong Kong in the near future. Well, this brings me to the end of the 13th stop of the Dins’ 2018 World Tour. Off to Bangkok, chaps. Greetings from China, as we continue on our 2018 World Tour! The Dins were busy bees during our stay, and had some opportunities to sightsee, but we were kept very busy performing and meeting Chinese students and their families. We first arrived in Shanghai, and on our first morning in China, we had the pleasure of visiting the Shanghai Tower, the second tallest building in the world, boasting the world’s highest observation deck and the world’s fastest elevators. From that height, we were able to admire the Shanghai skyline from a truly special perspective, and we couldn’t have asked for a better introduction to the city. A photo of the Shanghai Skyline! At midday, we visited the Yu Garden and Bazaar, with architecture dating all the way back to the 16th century. The Dins enjoyed shopping for a wide variety of goods, ranging from traditional crafts to one-of-a kind modern graphic t-shirts. Later, we dined at a restaurant in the center of Yu Garden, passing duck, shrimp, and dumpling dishes around the Lazy Susan, a glass turntable common in Chinese restaurant dinner tables, used to distribute food family-style. With full bellies, we then embarked on our first gig of the day, which took place at the beautiful Shanghai Town and Country Club. We were greeted with very beautiful welcome decorations for the event, and performed two sets for the audience, complimented by some helpful translation of some of our introductions into Chinese. Afterword, we were even treated to some very lovely hors-d’oeuvres! In the evening, we performed at the opulent Shanghai Kee Club, overwhelmed by the curated art and lavish décor. We enjoyed performing in the intimate environment before capping off our night with a dinner that we were humbled to say was also quite well curated! Our second day in Shanghai featured a full day of performing, starting off with a gig throughout the day at PhiSkin, celebrating the opening of the laser and skin clinic. We began in the morning with a flash mob performance of our signature song, Sh’boom, before moving into our first set of the morning. We certainly enjoyed playing up our antics for all of the guests and the media exposure. A photo of the Dins performing Sh'Boom as part of the PhiSkin Flashmob! The rest of our busy day consisted of hosting a meet and greet with middle school aged students and giving a public performance in a theater at Jiao Tong University. We spent the entire day—from sunup to sundown—in our tuxedo tails, exchanging more songs and smiles than we could count! Moving on to Beijing, we were lucky enough to be welcomed by Din alumni Wayne Fu (#129) who organized a wonderful dinner gig for us. We ate dinner with local families and talked about our academic journeys. The atmosphere was fun and light, as we tried our hands telling some jokes in Chinese, giving our audiences a few surprises. We owe so much to Wayne Fu for being such a delightful contact for us during our stop in Beijing and for being our Emcee for that gig as well. On our second day in Beijing, we met in the morning hold small-group discussions with Chinese high school students on how to focus their efforts towards applying to American colleges. We discussed topics like leadership, community service, time-management, and navigating the components of the application. The Dins had a great time sharing wisdom and exchanging stories with students with diverse talents from scientific research to origami and paper-cutting! An amazing meal of Peking Duck! Our main performance in Beijing took place in at a local University. Both Sam and Michael agreed to give talks on the themes that we discussed in the morning relating to applying to American schools. They also occasionally found their wits tested, in front of a very amused crowd. The Dins joined the school choir for a rendition of the stirring two-part choral, Can You Hear Me? by Bob Chilcott, which was a very poignant musical exchange dealing with the song’s theme of music, disability, community, and common voice. After all of that, we finished our time in Beijing with a last dinner of Peking Duck, which many found to be one of their favorite meals of tour! And with that, we had to say zài jiàn! Interested in financing for your small business? Apply online in minutes!